Happy Wednesday! I've got something really special for you guys today. I've rounded up my favorite holiday cards from Minted, my go-to resource for holiday cards, birth announcements, party invites, and artwork. They always have exactly what I'm looking for and they make it so easy to personalize and order. Plus, they always have amazing sales. Which brings me to say, they're having a fabulous sale right now regarding holiday cards! The sale is on holiday cards, 15% off orders of 150+ and 10% off order of 100+, and is going on now until November 22nd. 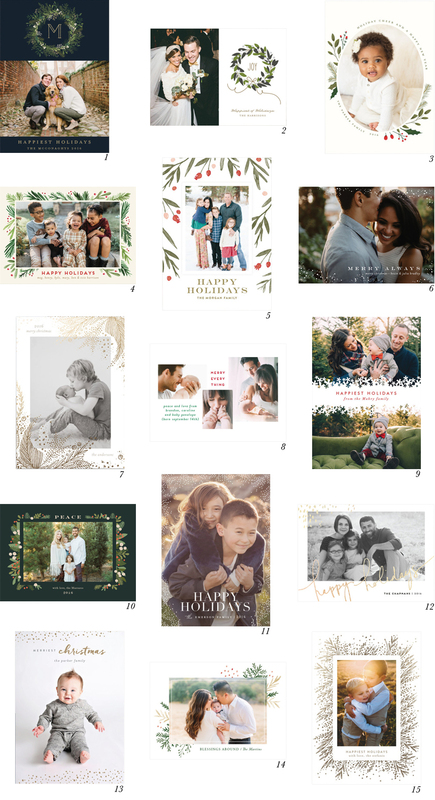 I should probably tell you the three things that make it a no-brainer to use Minted for your holiday cards, I mean, aside from their amazing selection. But if you've never used them before, then this will definitely have you using them this year. 1. They offer a Free Address Assistant. Does it get any better than that?? No need to handwrite them all, which saves on time. 2. Their Find It Fast option is like the best thing ever. Simply upload your photo, then watch as it appears in hundreds of different holiday card designs. Makes finding "the one" so much easier and faster. 3. And this last one is quite possibly the best thing with their sales. Buy your holiday cards now and personalize them later. Boom! You can take advantage of a promotional offer "now" and come back to finish personalizing with photos, text, or addresses "later", even after the promotion has expired. Besides sharing with you my favorite holiday cards from their site, I'm also hosting a GIVEAWAY with them! Three lucky winners will each win $100 gift cards to Minted, all you have to do is enter here. The giveaway is open starting today until November 23, 2016 and the winners will be contacted directly by Minted. This post was in partnership with Minted but all opinions are my own. Thank you so much for supporting the brands that keep this blog going!